AFSCME 3299 demonstrators fill the intersection of 4th St. and 16th St. of San Francisco by marching and chanting along the crosswalks. 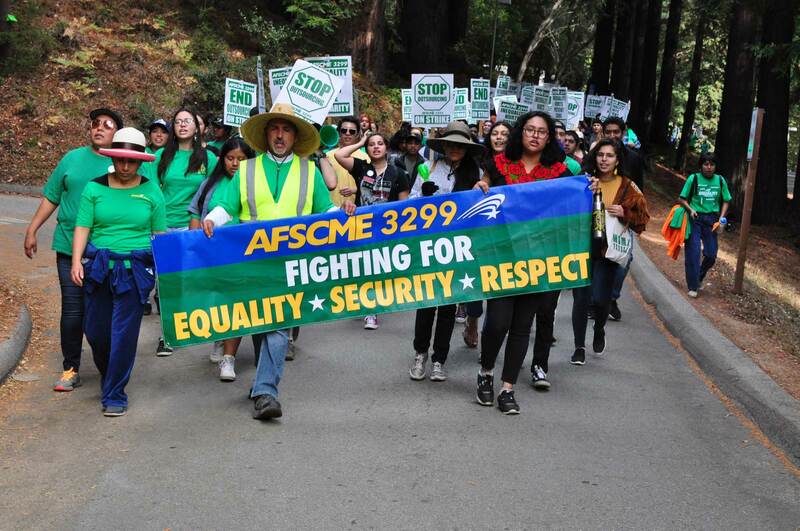 For the second time in a little over five months, AFSCME 3299 members went on strike. This time, however, it’s not from the absence of a contract, but receiving one they did not ask for. Earlier this month, the university imposed contract parameters on patient care workers without their consent. In response, the patient care workers voted to strike with 96 percent in favor and the 25,000-member service worker unit voting to strike in solidarity from Oct. 23 to Oct. 25. 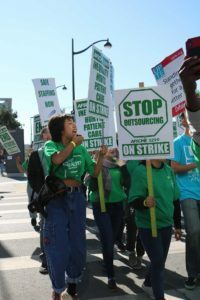 “We’re striking because the university has decided that it wants to increasingly outsource jobs to save money and that it wants to deny [workers] a fair contract that they deserve,” said Todd Stenhouse, AFSCME 3299 representative for patient care workers at the UC San Francisco medical facility. The patient care (EX) branch of the union, which operates under a separate contract from the service (SX) branch, has been in deadlocked negotiations with the university for almost 18 months. According to a press release from AFSCME 3299, the university imposed employment terms on patient care workers that would increase healthcare premiums, flatten wages, lift the retirement age and continue outsourcing union-protected jobs. “We can’t solve the problem alone. We need the UC to sit down and commit to ending this practice.” said Chris Flink, AFSCME media contact for UC Santa Cruz. To accommodate for strike activities, many UC health centers took precautions to ensure that the workload was manageable with the reduced staff. At UCSF, surgeries scheduled during the strike were reduced, clinic visits and outpatient procedures were postponed and temporary workers were hired. 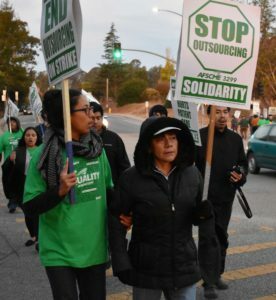 AFSCME 3299 EX unit president Monica de Leon pointed out the hypocrisy of the university’s stifling labor terms placed on patient care workers, while its leaders enjoyed pay raises and hid slush funds. “UC’s latest actions represent an assault not just on the collective bargaining process and the frontline workers that make the UC system run every day, but on the values that this institution is supposed to represent,” said de Leon in a press release. Nicolas Gutierrez (second from left), a senior custodian from College 9, was a key member of the strike effort, leading the march and speaking at rallies. Though the sun wouldn’t rise for hours, at 4:50 a.m. on Oct. 23, AFSCME 3299 members set up tents and tables at the main entrance to campus. Accompanying them were the notes of a harmonica and the watchful eyes of police lurking in the shadowy lot across the street. By 6:45 a.m., about 50 protesters marched from corner to corner around the intersection at Bay and High streets. More protestors arrived and joined the action as the sun came out, overseen by several volunteer crossing guards. Although spirits were high and the campus entrance remained open all day, police maintained a constant presence at the base of campus with cars being sent to the West entrance as well. Police ticketed jay-walkers and several vehicles for obstructing traffic. UC Chief of Police Nader Oweis said he could not give an estimate of the number of UC police present at the strike at this time, but at the May AFSCME 3299 strike, about 125 officers were present. Students accounted for about half the strike presence, emphatically leading chants, serving as crossing guards and keeping energy levels up. Striking workers welcome support from the campus community. The protest was scheduled to shut down by 6 p.m., but the picket line did not put down their signs until the sun began to set. A student organizer leads a chant at the UCSF march. AFSCME 3299 protests from around the Bay Area joined patient care technical workers at the UCSF Medical Center on Wednesday. Some arrived by BART or carpool — about 60 people from the front lines in Santa Cruz were shuttled by bus to the rally. University Professional and Technical Employees (UPTE) union members and hotel workers represented by UNITED HERE additionally came to support. Between AFSCME 3299 and UPTE, the number of patient care workers at UCSF represented by unions totals 7,176. Concerns about outsourcing resulting in inadequate and insufficient employment — as well as gender and racial inequality — were prevalent among many protesters during the strike. However, for others, the issue of economic inequality stood equally grave. UCSF administration were critical of the union’s decision to strike. Chancellor Sam Hawgood and UCSF Health CEO Mark Laret issued a joint letter to the UCSF community elaborating on their stance on the strike. 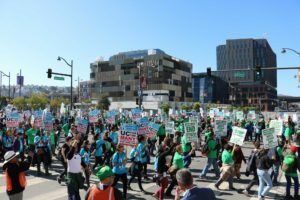 The UC has been outspoken in its denunciation of the AFSCME 3299 demonstrations in the past — considering the strikes to be illegal and a direct attack on patients and students. The UC released several additional statements urging union members not to participate in their union’s strikes. These statements claim the UC has offered patient care and service workers reasonable contract terms, including what it describes as adequate pay increases and excellent benefits for the next four years. These statements also maintain the university is supporting employees who plan on coming to work during strikes and will not deduct union fines from employees’ paychecks in the event non participating union members are fined. Chancellor Blumenthal said that despite this being the second time AFSCME 3299 workers have found it necessary to strike, he did not feel it was appropriate to advocate for the workers in the context of his role as chancellor. AFSCME 3299 demonstrators march at the base of campus. The last day of the strike will entail picketing and tabling. Loop bus drivers will remain on strike until Thursday night and city buses will continue to respect the picket line until AFSCME 3299’s strike concludes. Student support so far has invigorated the strike actions at the base of campus, and union workers hope they continue to participate. According to Chris Flink, AFSCME 3299 spokesperson for UC Santa Cruz, this is proof the Santa Cruz population stands behind the workers. Chris Flink at the UCSC protest emphasized that the issues of the workers are inextricable from the city itself. The university has made no moves to change its stance at time of press. Additional reporting by Karen Lowe and other CHP staff. Next articleRent — How Do You Measure a Crisis?